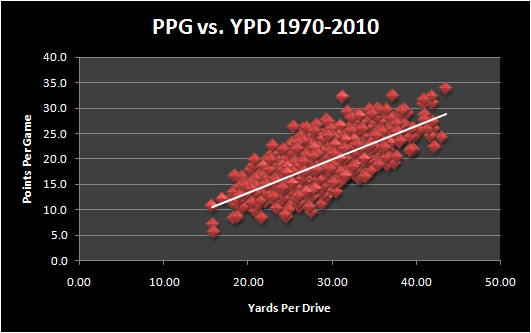 – Offenses which generate more yards per drive tend to score more points. But this doesn’t tell us all that much about offensive efficiency because a team which drives 80 yards every time they have a ball but never get touchdowns (instead settles for field goals) isn’t a model of efficiency. – Long drives which don’t necessarily end in points can still be productive. The chances of scoring on a particular drive are somewhat dependent upon a team’s starting field position. Starting a drive at the 50 is more likely to result in points than starting a drive at your own 1 yard line. 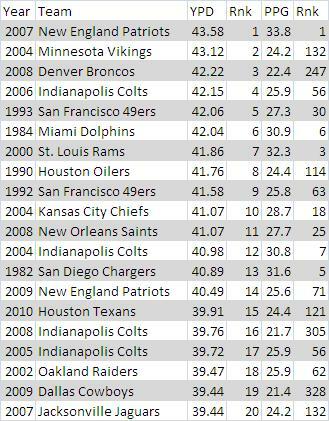 Teams which generate a lot of yardage per drive are more likely to win the field-position battle in a given game. Indirectly, this should lead to more points in the long run. Here we see that there’s definitely a correlation between offenses which score a lot of points and offenses which generate a lot of yards per drive. 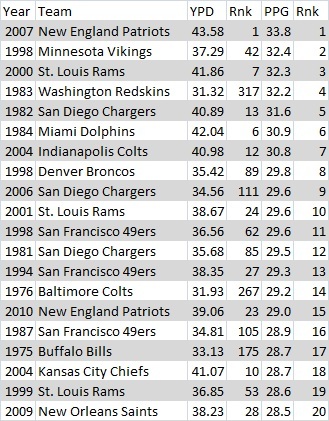 Again, this doesn’t really tell us much about an offense as any team which scores a lot of points is going to have to get a lot of yards unless they have extremely good special teams or a defense which creates a lot of turnovers (in either case, the average starting field position would be improved to the point where less yards would be needed to score points). You’ll notice a lot of the same teams as in yesterday’s post. 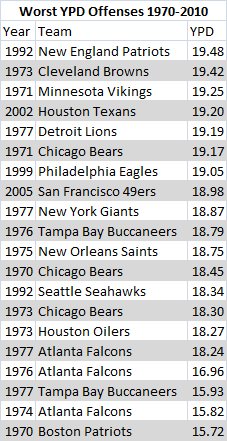 What we see is that while high yards-per-drive offenses tend to score a lot of points, there are a few teams which scored a lot of points but weren’t particularly high in yards-per-drive. The most noticeable example is the 1983 Washington Redskins who had the 4th highest scoring offense of all-time but aren’t in the top 25% of best YPD offenses (and they were only 5th best in 1983). Five of the top 10 PPG teams are in the top 20 of YPD but there are seven teams here outside of the top 100, including the 2nd and 3rd best YPD offenses. 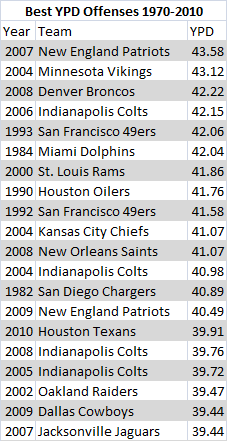 The reason (which you might have guessed) the 2008 Broncos vastly underperformed relative to their YPD is the same reason the 1983 Redskins over-performed: turnovers – which will be the subject of tomorrow’s discussion.